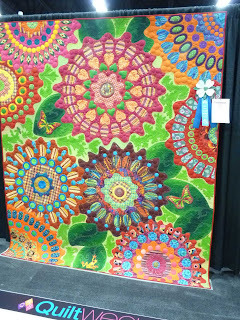 If you were not able to get to the AQS Lancaster or Paducah shows, then you missed a fantastic exhibit. AQS has brought back two men from Eqypt to the US - men who still create this wonderful artform. These are some of the quilts that they make. When I call them quilts, I use that loosely. The "tents" are made originally for celebrations. 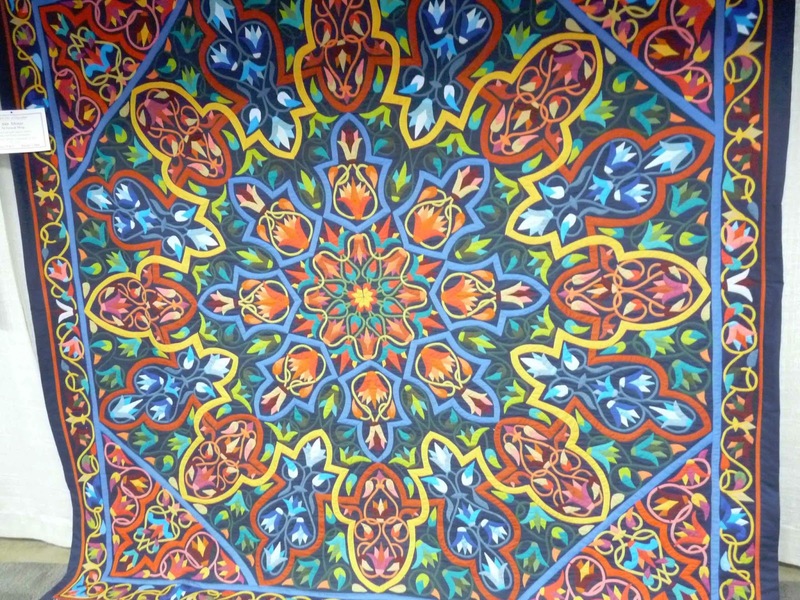 The outside of the tent is a canvas, and the inside is this wonderful and colorful applique. At Paducah, both men were sitting at the exhibit appliqueing. It was really neat to see and watch. 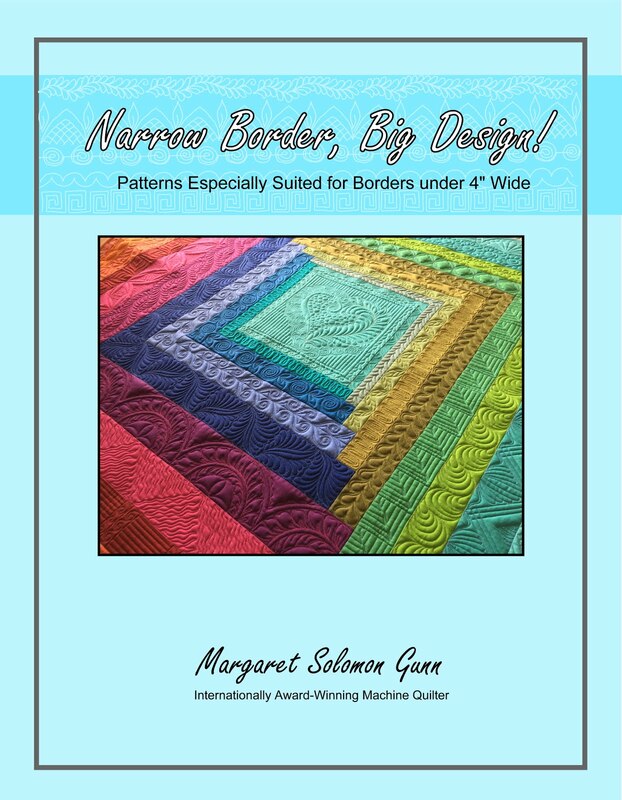 As a quilter that loves to applique, I find this very exacting. I use tiny, thin needles with very thin thread. My seams are very carefully turned, and many small stitches are taken. They are much different. They cut crude shapes with large shears, then turn the edge under with a honker of a needle, and what is probably only a 40wt thread! Their stitches show, and are not super close together. Their process is built for speed, and production. But look what they make...Isn't it wonderful?! 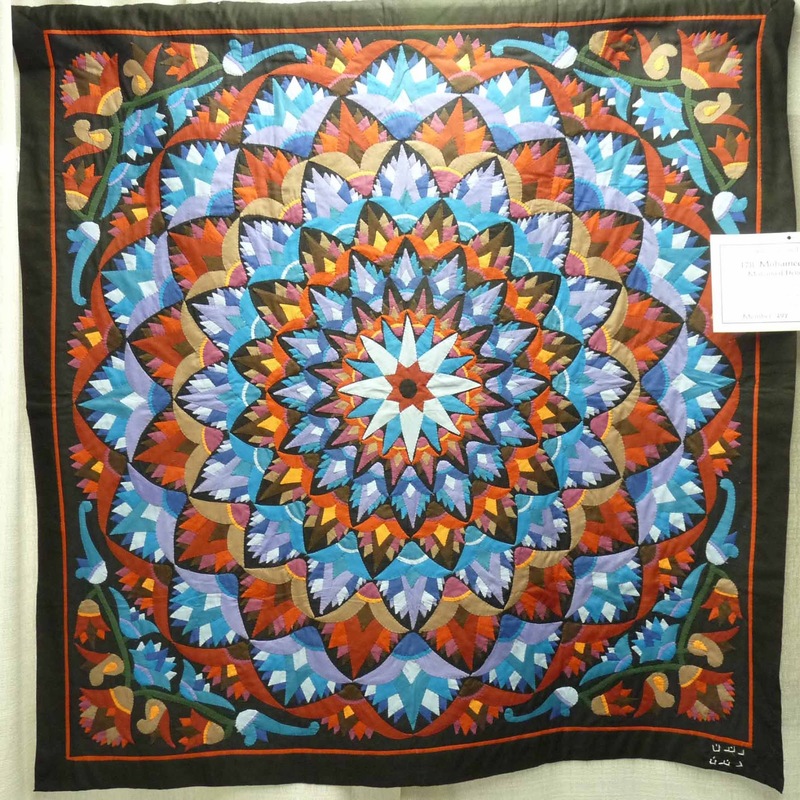 There were many quilts at the show for sale, ranging from about $500 to 1500. Boy I would have loved to have had one. I'd love to make one, but I am not that crazy. I'll leave that for my facebook buddy Megan Farkas - her's will be amazing someday when she is done. 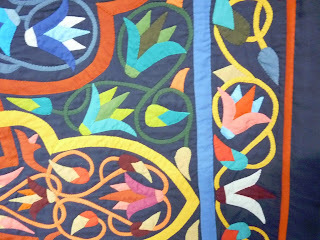 The Tentmaker's quilts are all so colorful, and geometric. 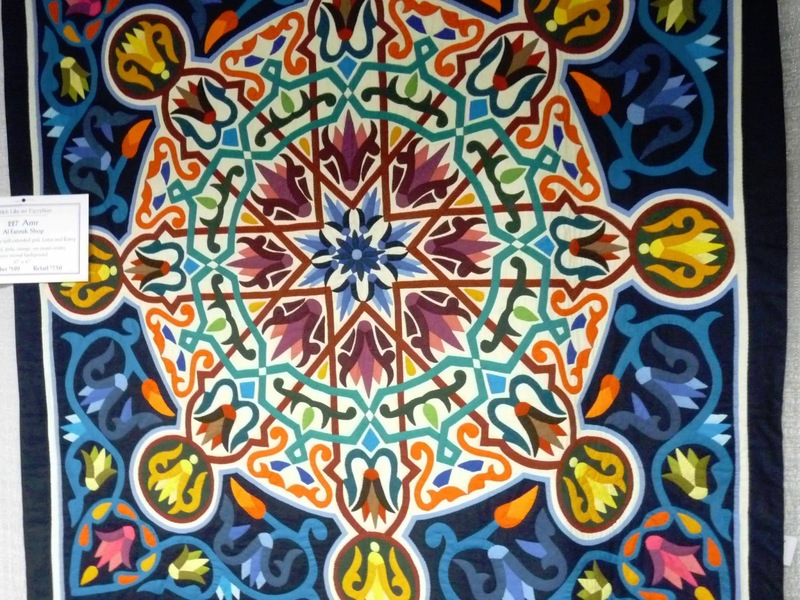 I am amazed at how they get such good symmetry when they mark off the applique shapes with a block of chalk (no, not a visible pattern to be seen). I mean, seriously, is this not gorgeous and amazing? ...this one too. And they are designed & made by men. They really are fantastic. I love the dahlia shape, so this one is so intriguing. I cannot imagine how long it would take to make. Forever probably! I have had it in my head all day that it is Friday, but it is one of the good things I am wrong about! Though most people long for and look forward to Friday, I am much the opposite. Monday is much more appealing. The busyness of the weekend is over, and the kids are back to school. It's been a busy week. Tomorrow will be no different. Frantic at times trying to finish (OK, that is a huge stretch, but I do need to get the quilting to a suitable stopping point either tomorrow or Monday so that the quilt can come off the frame). This means that there are no large unquilted areas, and any area I have marked is stitched, as I will be removing all of the blue pen. I don't want to leave it on the quilt for the next 3 months. I anticipate getting back to finishing the quilt in September. Today marks day 9 of quilting on the silk quilt. My mind really needs to work on something different. Fifty hours of staring at the same quilt is enough. Today I started on the teeny-tiny fillers. Three of the four corners are just about done (if you don't count the part I have to rip out!...Frog, as the quilters say. I am not in the least bit thrilled that I have to rip out fourteen stitches to the inch silk thread, on silk fabric. Seems a tad risky. Foolish might be a better word. I will look carefully from further than 6" when I get it off the frame and see if it is really necessary, though I suspect I already know that answer. These are both variations on fills I have done before, only they have been micro-filled. The top picture has the 1/2" interlocking circles (CC), but I filled in the space. I'm not sure why I did this, because I used it on Big Bertha and kind of didn't love it. Did I not learn my lesson??! Below, I have a variation on clam shells. They too are filled to give a dense background. It was all going pretty well first thing this morning until I realized I'd densely filled a section that I had not added a band of pearls (circles) to. Frig!...Talk about ticked...Thank goodness the back of the quilt is not silk - otherwise I wouldn't stand a chance of getting the stitches out! 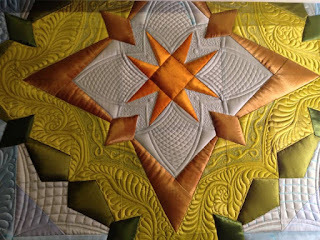 The silk radiance is truly gorgeous, but on the flipside, it is a solid fabric so there is nothing whatsoever to hide blemishes in the quilting. Kinda glad my next quilts are fun with some print! I have this tree in my yard. 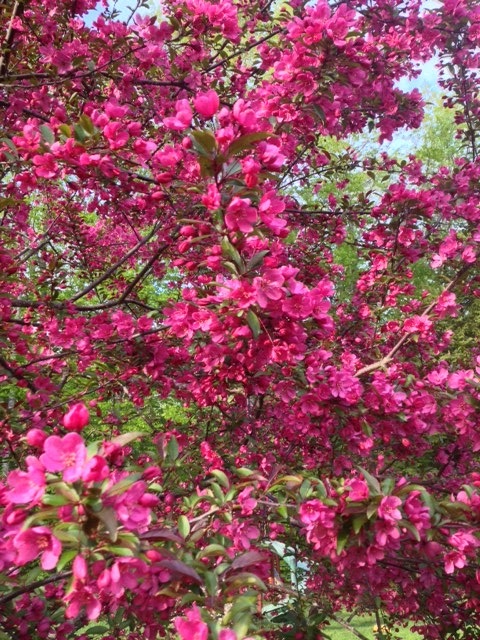 It's a crab-apple. 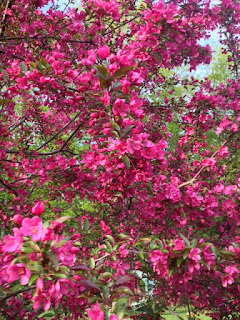 It's the sweetest smelling, most Fragrant and gorgeous tree for about 1 week each year. I'll leave you with this picture. It just makes me happy. Just a selfless toot of my own horn here today...Last week Sherry Reynolds emailed to tell me she saw me on the side of truck. 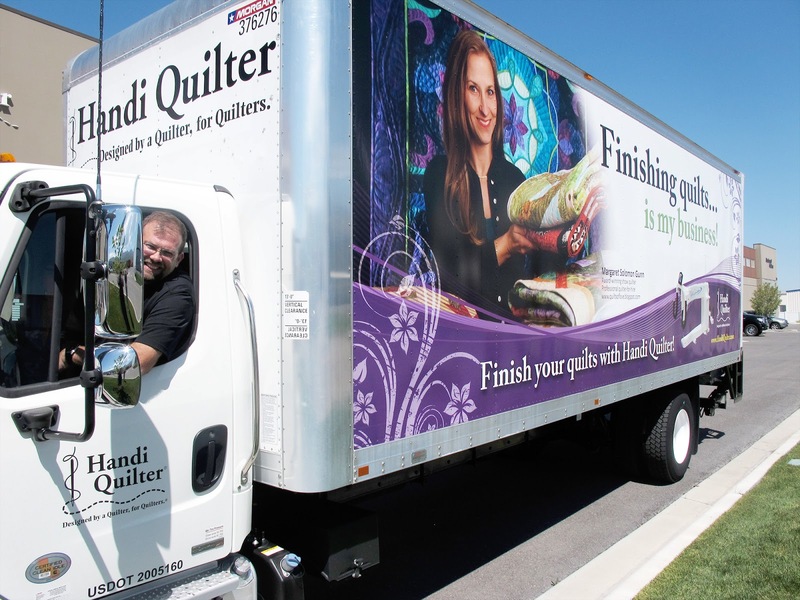 I hadn't heard yet that HandiQuilter had put me on one, but pretty well assumed that was it. Sure enough...there I am. On my backside is the delightful Kimmy Brunner. You may have seen her HandiQuilter ads in magazines (she does one with a military service person). Well, mine are coming out soon, if they aren't already out now. 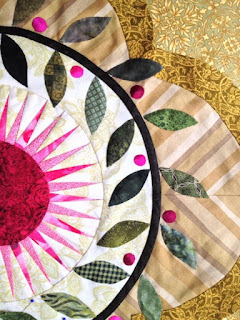 I will leave you (because my 6-yr old is chomping at the bit to go for a walk) with another sneak peek of the silk quilt I am working on. 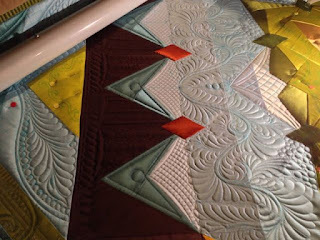 I have one more week allotted for this quilting before I will move onto more important projects (Your's!). I'll get back to finishing the loose ends in the fall. I am pretty pleased with how it is coming along. I made it to the center today - after 5 days of quilting. The texture is delicious! No time for much of a post today, but here is a sneak peek of the silk quilt I am quilting. I am about 13-14 hours into it. The center is within sight, but I won't probably do it tomorrow. I haven't encountered any big problems, so it is moving right along. My hardest issue is that it is set on point, so its hard to stitch long sections before I have to change thread and do another. There are some fills not done as well, but it is stabilized adequately to move on and come back to the fillers. Please do NOT post this to Pinterest. As most bloggers will say, they are considerably busier than their blog posts will suggest. I am no exception. I am down to the 5 week buzzer (as in 5 weeks until school is out and the house is buzzing with 3 kids), and I am rapidly trying to fire through a list a mile long of things I am working on. Some are my projects, while many are not. Either way, if I don't get them done, they may not get finished until late August unless they are handwork. I may have to selectively either sleep less or take 1-2 hours in the evening to quilt to stay caught up. With warm and long days coming, I'm not sure that option sounds appealing though! First things first...This is my 60" top. It's fairly simple and is my first of such pieced quilts using silk Radiance. The top is lovely in person, having a beautiful sheen. It's far from perfect though, as matching points is harder with this slippery fabric. I have 2 diamonds still to applique...I know, I know. no biggie, they will get done. 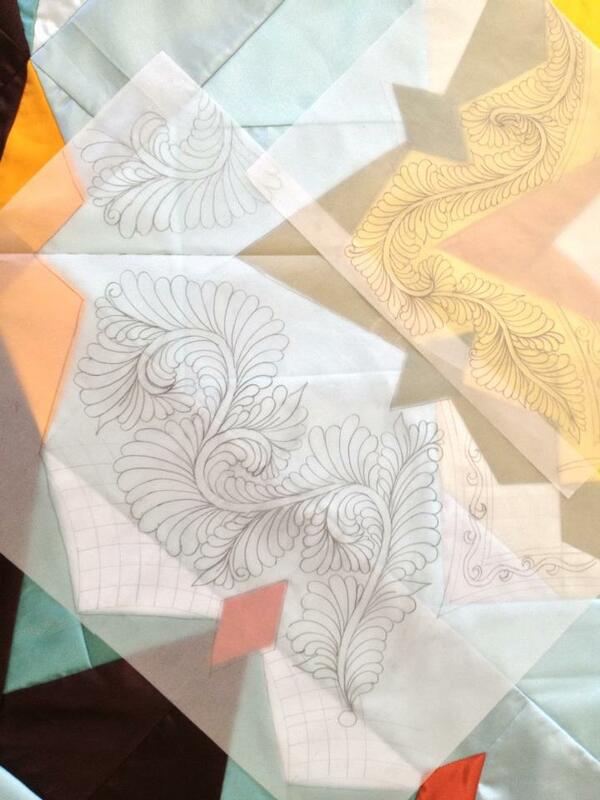 A couple weeks ago I started sketching the quilting plans for this quilt onto tracing paper. I design quilting so many different ways -- sometimes I draw on the electronic pen tablet, sometimes I just sketch on copies of the quilt. I was finding it difficult to get a sense of the actual scale of where I was going to be quilting, so this time I just sketched full scale. The difficulty here, though, is obvious. I have to transfer these to the quilt. 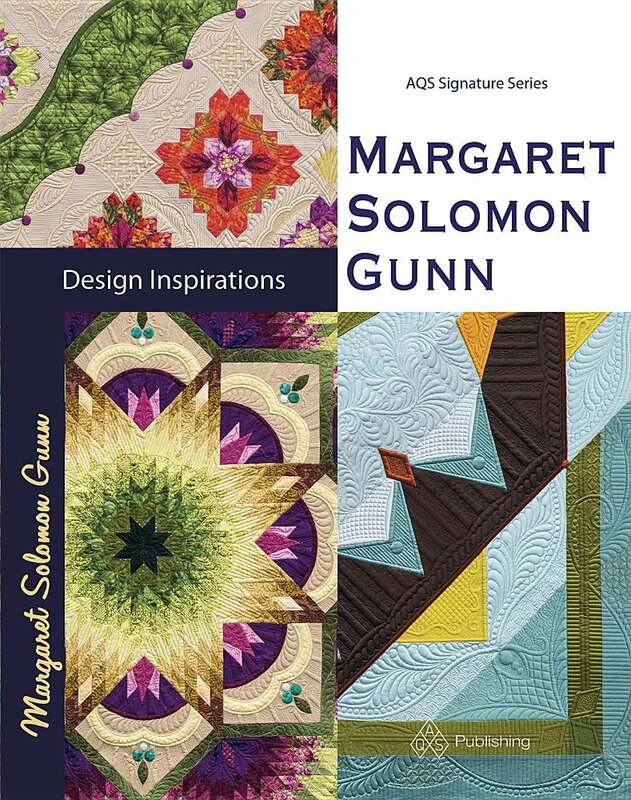 For simpler designs, I might make a cardboard/cardstock template of that spine, but this quilt has several areas that are of equal complexity, so something else is needed. Also, I want decent symmetry when designs come together. I do not possess a traditional light box, which many quilters have, because I generally don't trace designs. 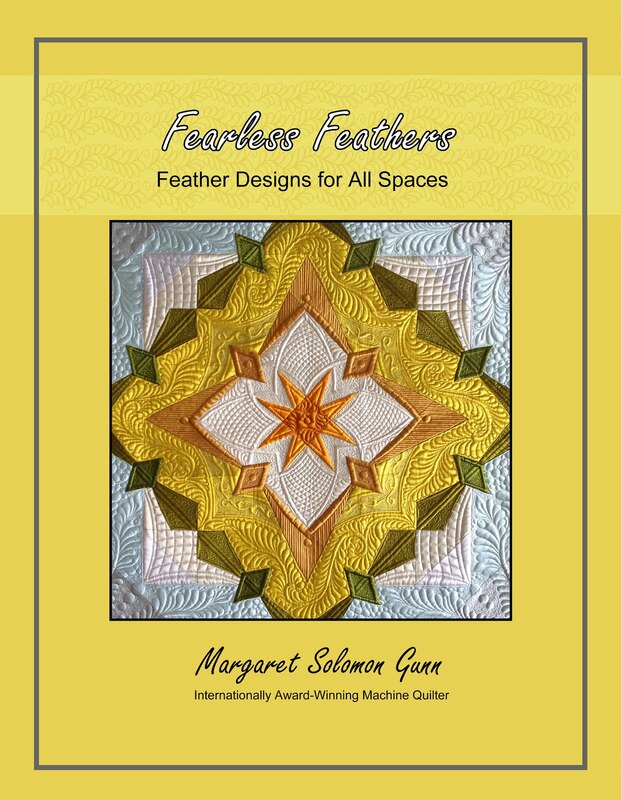 For this quilt, I wanted to...maybe not down to each and every feather (a little non-uniformity is OK afterall), but the basic shapes should be in the same places. I have subsequently converted my dining room table into a modified light-box by replacing the center leaf with a 24" slab of plexyglass. There is a lamp beneath the table. Voila! The interfaced silk is not the easiest to see through, and the seam areas are nearly impossible (thank goodness this is simple), but it is going to suffice. Hopefully I will be quilting on this if not tomorrow, then soon. We'll see if today really is "Mother's Day"...if so, then tomorrow. If not, then this week sometime. I'll show a progress snippet of another of my projects before I show a few client pics. I work on this at dance lessons, and in the evenings. I have made creating hand-made quilt designs a science so that I can still have time for my own things! Everything but the pointy star is stitched by hand. This is just one corner - three more are in the works. 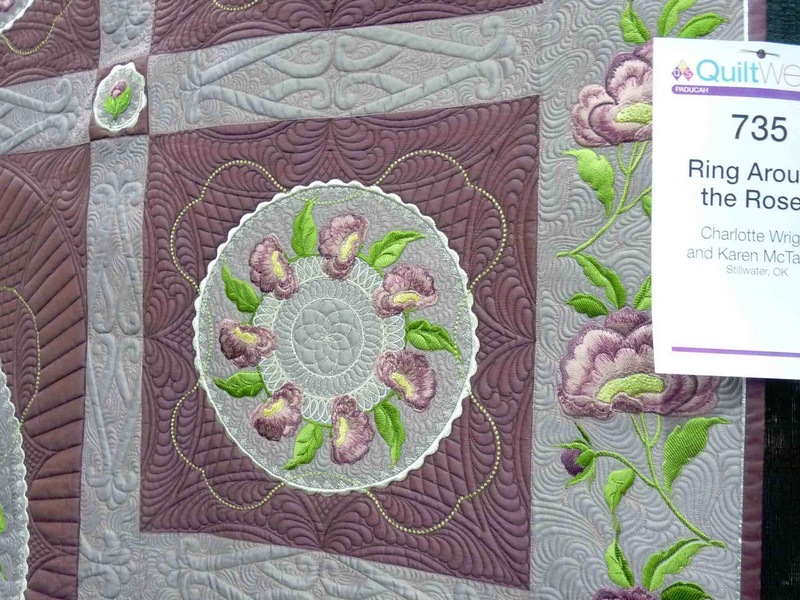 To create an added dimension, I am adding features of the silk radiance to this quilt. The berries are in 3 shades of silk, as is the brown bias frame in the following picture. I have designed this quilt completely around a 1/2 yard piece of the floral Benartex Charlotte fabric. I have had this 3-4years, and loved it, but just never knew what to do with it. It is the inspiration for the color palate. The rest will follow. There will be more applique in an outer border through the taupe fabrics. My goal is to have it done by November 1 so it can be quilted for next season, but that may well be crazy. I have most certainly been busy with client quilts. This most busy and colorful quilt was on the machine for a week or so, and then for another day this past week to add to what is below. 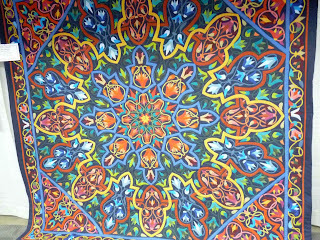 The Kaffe Fassett prints are bold and colorful, and pose a most obvious difficulty in creating a custom quilt that has quilting that really shows. I won't show any more of this quilt right now, but you will see more in the future. I have done yet a 3rd of these adorable owl baby quilts...I love it. It is a small, manageable project that quilts up in about 5-6 hours (yes, I am slow!!). Since I don't buy any cutesy fabrics, I am always amused to see some of the most adorable stuff that is out there, like the backing for the owl quilt. Is this not great?! The thread doesn't show significantly in the pictures, but it is a gray Glide and adds a nice shiny dimension. And another...Becky's argyle quilt is for her young son. It's made with shot cottons I believe, and backed with a sheet. 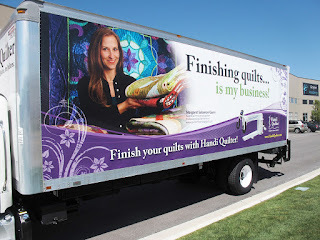 Yes, I realize many quilters run for the hills at the smell of a sheet backing, but seriously, I see them all the time and they cause no problems. Just recommend to your clients to not go for the 3-400 thread count ones, and to prewash. They are just fine. 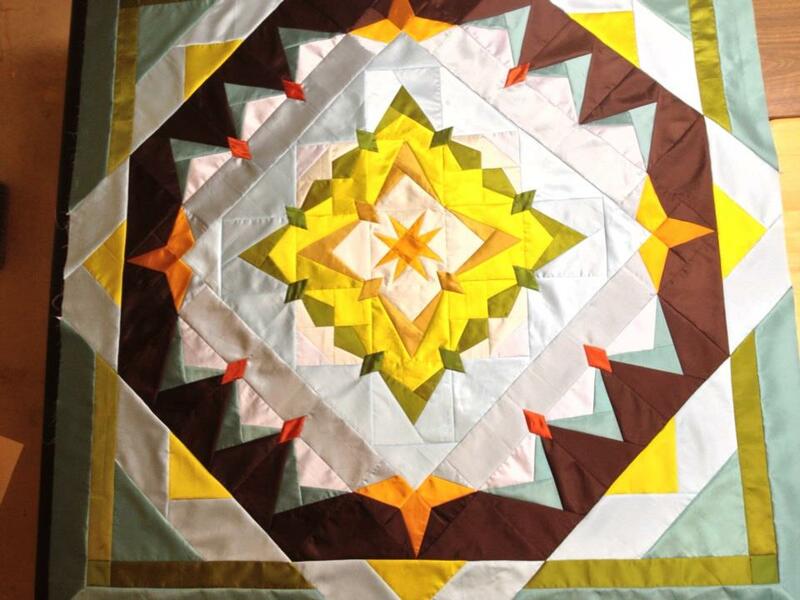 This quilt is stitched with the pattern Razorgrass. It's edgy and all boy. The pattern is really dense. It takes me nearly a half hour to make one pass of the quilt. I used a soft blue Omni thread for this quilt since the Omni is a little more robust than some other threads, and I didn't think that her son really needed a thread with sheen like Glide. I want to say something about these shot cotton fabrics. 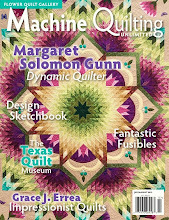 I realize many quilters really love them. 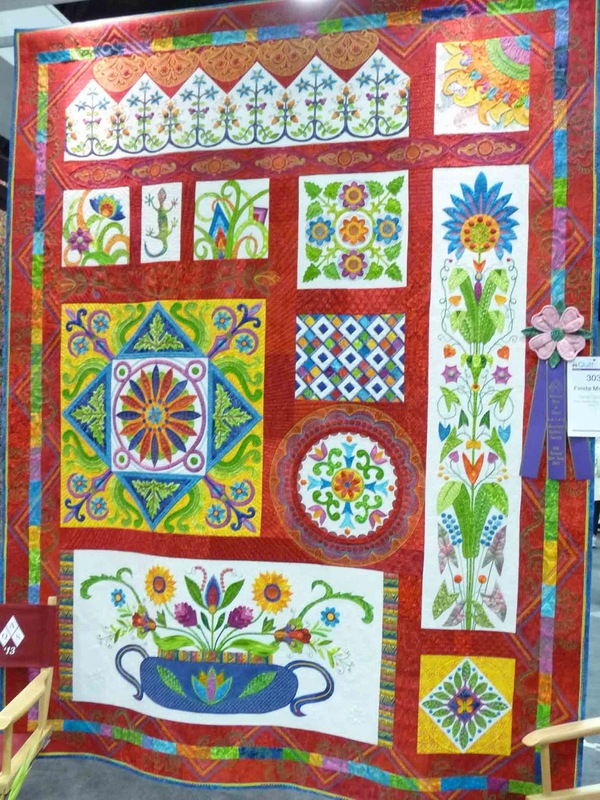 I saw a show quilt done in them recently that is breath-taking. But they are very thin fabrics, almost gauze-like. I could see shadowing through two layers of this soft blue! 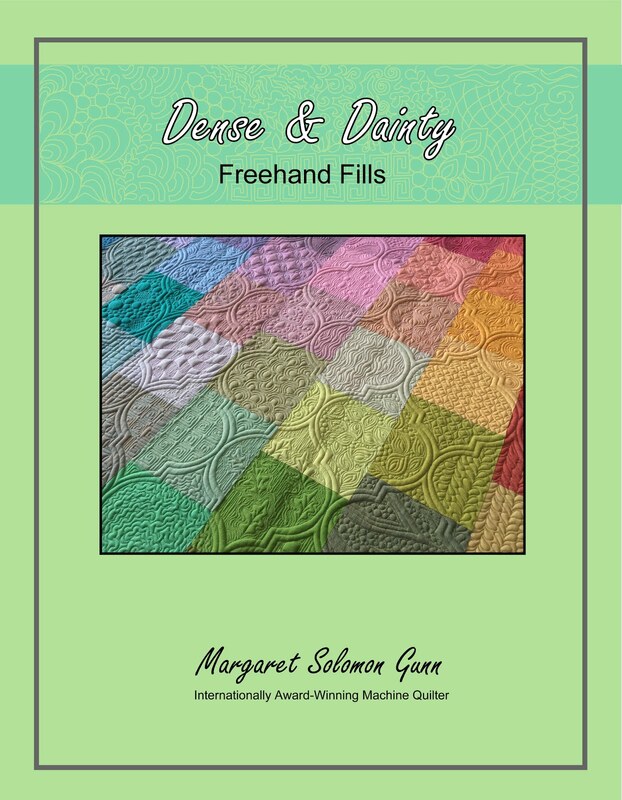 I, personally, might avoid such fabrics for a quilt that will get a good bit of use/abuse. JMHO...I also subscribe to the belief that they are very pretty and luminescent, but they aren't immensely durable feeling. That's what I have been up to. How about you??! Ever wonder what it takes to win at Paducah?...Yea, you and me both. 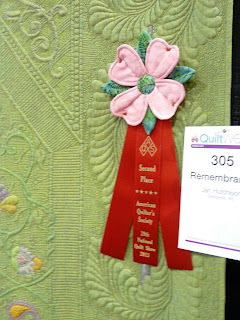 I spent many hours while I was there studying and photographing different aspects of quilts, both winning and not. It is truly the most phenomenal display of talent I have yet to see. I took way too many pictures to count, but I thought I'd show just a few. 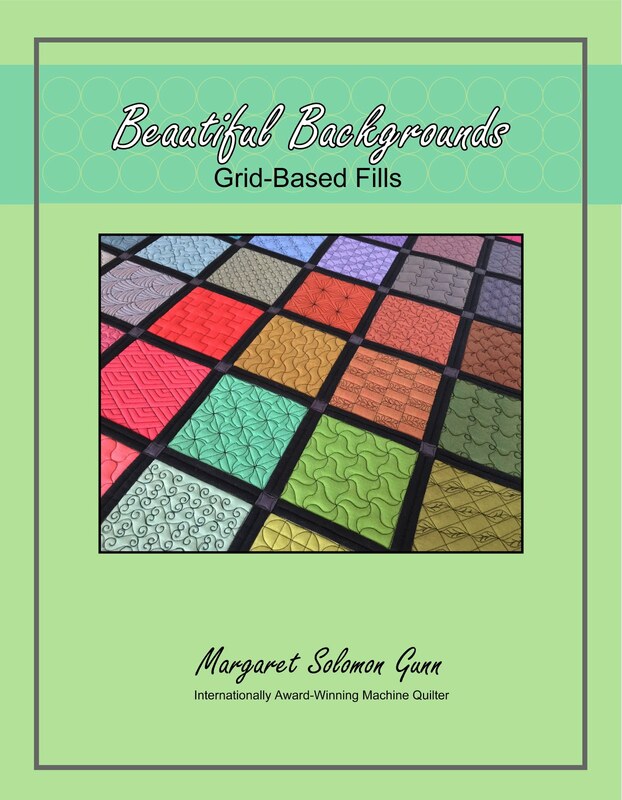 These in this post are all machine quilted -- some by longarm and some by domestic. Don't get me wrong, the hand quilted quilts were equally as impressive, but the subject of Japanese quilters needs a chapter all of it's own. They will blow your mind completely. 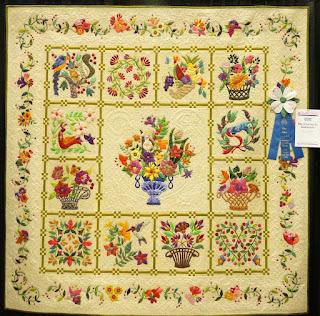 This quilt is by Lois Podolny, "My Journey to Baltimore", and it won 1st in the large wall/home machine quilted category. It is just perfect, in the design of the appliques right down to the tiny details of the machine quilting. Look out if she enters this in a show near you!...it's a winner for sure. Look at all those tiny circles - You know how much I LOVE making and appliqueing circles on my quilts. 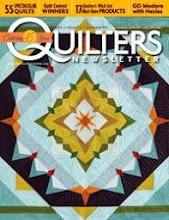 Here's another quilter after my own heart. As good as the applique is, the quilting is better. 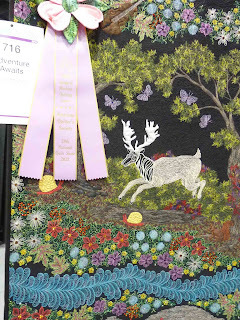 "Celtic Summer Celebration" by Jaynette Huff took 2nd in the same category. It has TONS of bias applique stitched in a Celtic manner, but the machine quilting took a secondary seat, as there really was very little open space on the quilt. 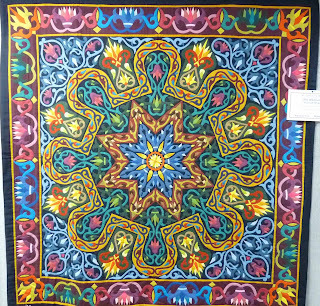 I have seen this at least once before, but Terri Doyle never disappoints with her whole-cloth quilts. 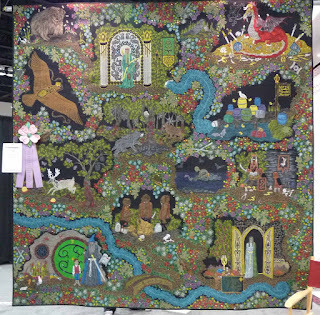 It is called "Secret Garden", and took 2nd in Large Wall/Longarm quilted. This is the category that my Zen Garden quilt was in. 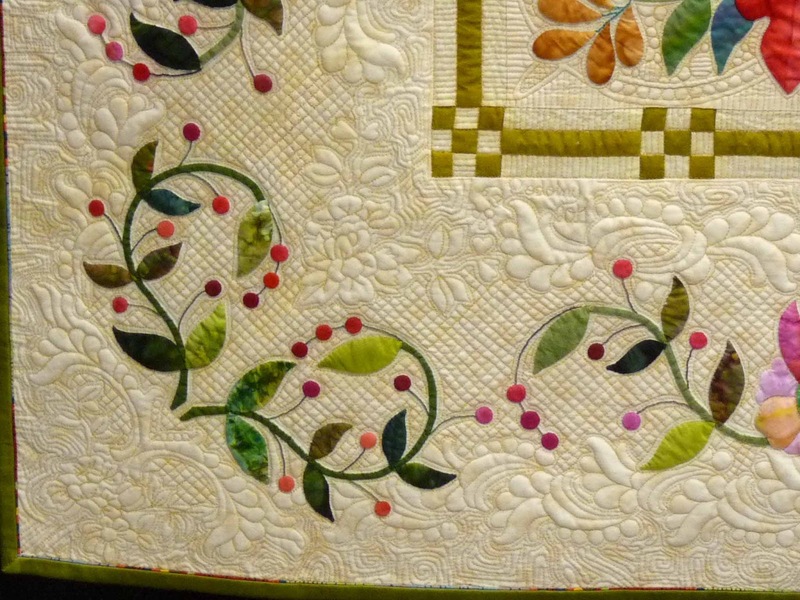 If you double click, I think some of the details of her quilting are more visible. I don't really know how AQS or any show can fairly judge a top that has no piecing whatsoever with others that are heavily and accurately pieced, but that is how they do their categories. 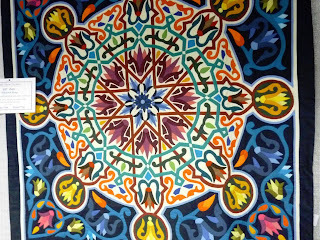 Seems like there might be more such beautiful whole-cloth quilts if they had their own category...JMHO. 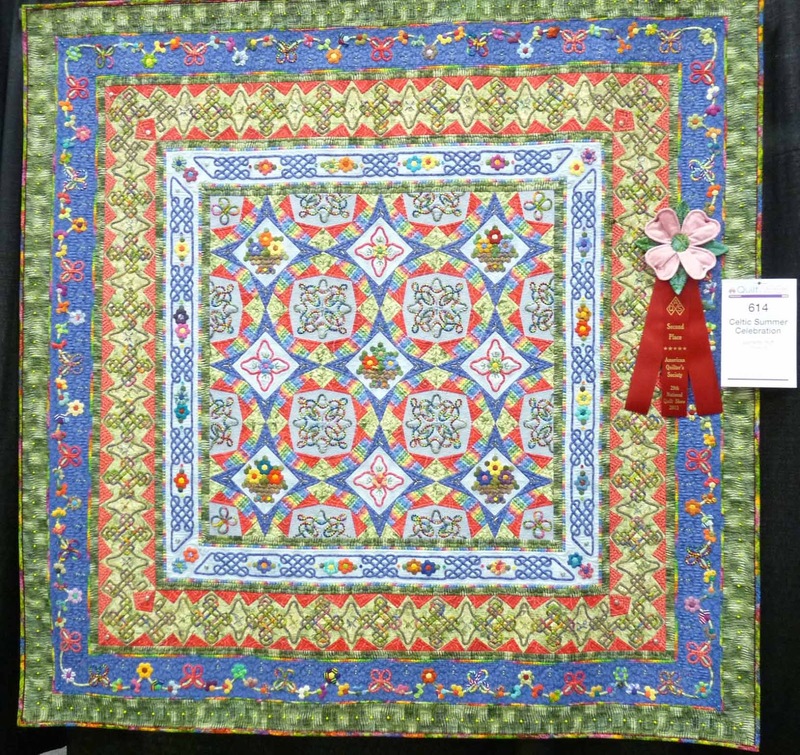 1st in my category is Mark Sherman's "Poppy's Rainbow". 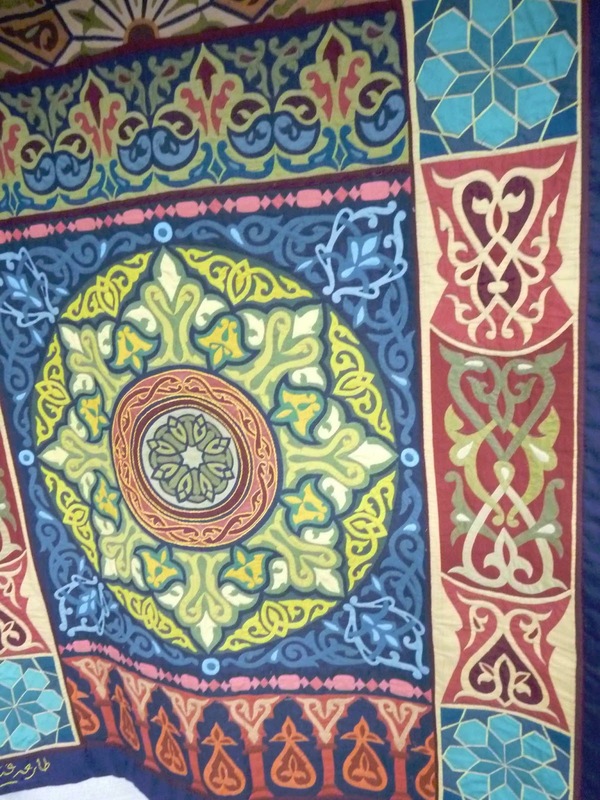 It is a very large and impressive quilt. Much of the quilting is in coordinating threads so it is hard to see. On top of that, it is displayed with a chain so you can't even get within 6-8 feet of it. It's turned edge applique, stitched on the machine, and embellished with lots of twinkle. 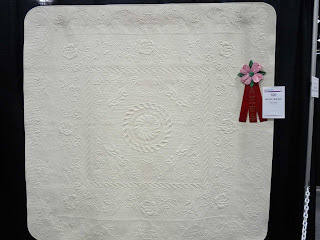 I didn't take pictures of all of the bed-sized quilts that were machine quilted -- just the ones that I really loved. This is a part of Jan Hutchison's "Remembrance". You can go to her blog on my sidebar to see other pictures that she took. It's a wholecloth, thread painted and trapuntod. It is absolutely gorgeous in it's design and execution. FYI- that green is a Kaffe shot cotton, and is dreamy in person. She should have taken first in her category (if I was a judge!) - her quilt blows the competition away! One of the things I noticed about this show is that the quilts downstairs (which included the hand and machine quilted bed and wall quilts) in general were much more impressive than their smaller wall counterparts. 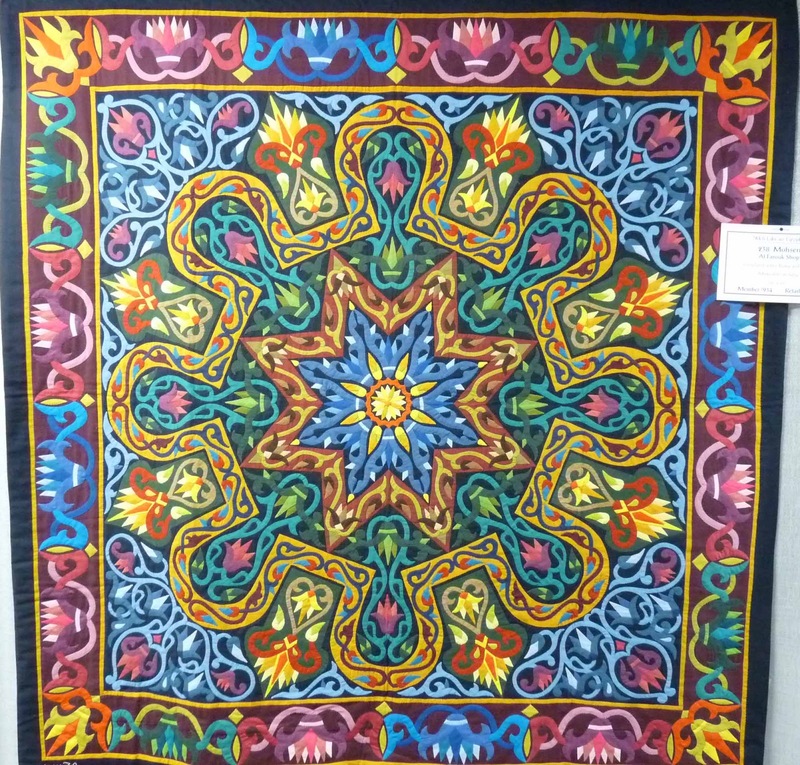 So many more of the larger quilts were just jaw dropping. The contingent of Japanese hand stitchers thrown into this mix (and they were largely downstairs too) was so amazing. 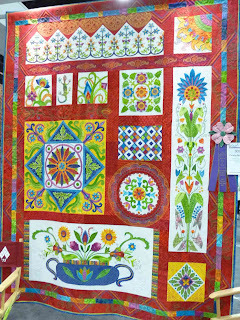 Going to see the smaller quilts, sadly, left me mostly underwhelmed and just wanting more detail. It's hard to say that because there were good ones up there. 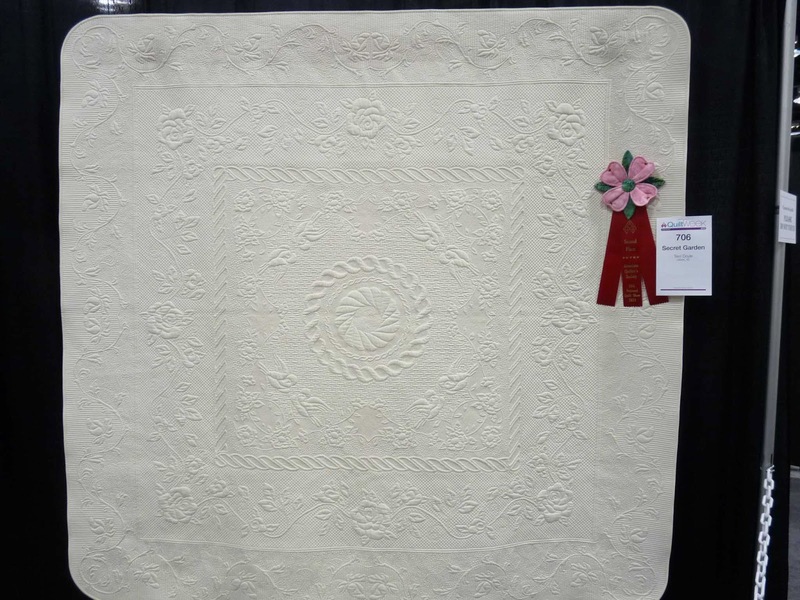 Heck, even I had a small wall quilt in the show. But so many of the non-ribbon winners downstairs blew your mind, but only the ribbon winners upstairs were in that position. 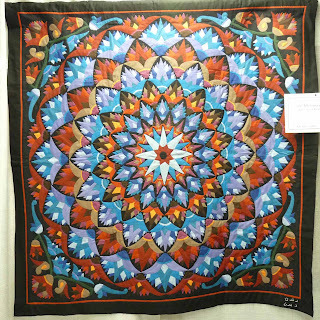 Sue McCarty's quilt is also headed for the museum, where she has at least one other one residing. 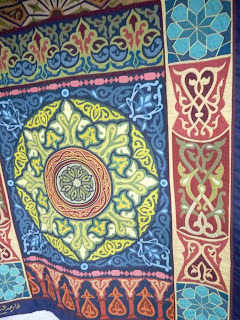 It is a wholecloth quilt exclusively created with thread. There may be a little bit of painted items too, and a ton of crystals as well. It's mind-boggling to see in person. 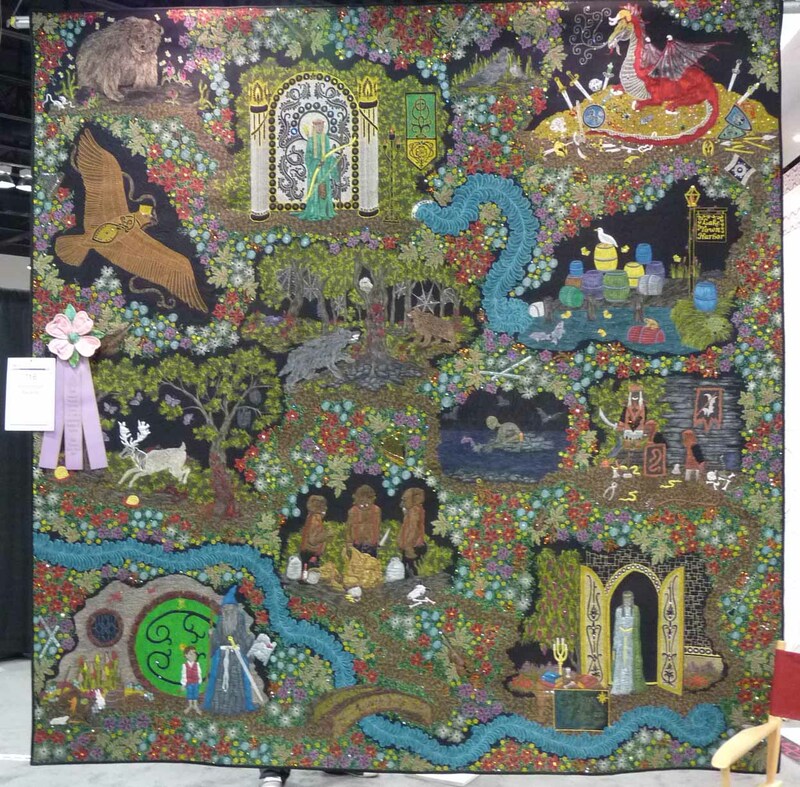 Here's a closeup...There was a person sitting by the quilt telling viewers how many yards of thread she used. I think the number is like 50000, but I can't really remember. It's crazy how much though! I'll end this with a couple others that caught my eye (of the machine quilted ones). 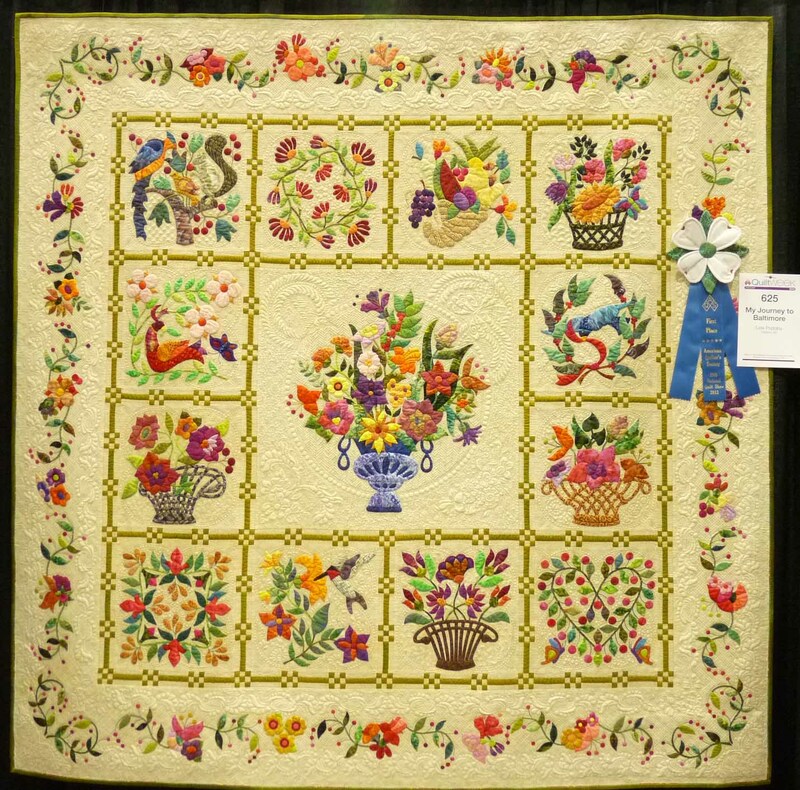 Karen McTavish quilted this quilt (like we couldn't tell from the narrow and graceful feathers everywhere!). And this quilt just satisfies my eye's need for certain colors. I like it. I have been busily working through the quilts in my backlog, trying to get as many of them behind me before my kids are out of school next month. I do have a few I could share in a future post. 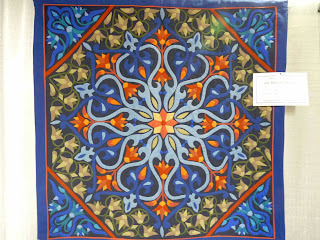 I am also in the process of creating the design for my silk quilt, as I hope to quilt part of that in a week or two. Playing with satin. Or if you aren't great with spelling and feel challenged, it may read like "Playing with Satan". I made this lap quilt last December. It is a cranberry satin on the top and a printed poly (gasp!...kind of satin-like) on the back. In hindsight, it probably should have had a quieter fabric like flannel on the back, but I was trying out fancy fabrics and in a "What the hell" mood that day. The design process of this quilt was relatively simple...I marked the center square, marked some angles, eye-balled a few things and then pulled threads. I really expected the colored Glide threads to show more than they did, but it was sort of an experiment. It was supposed to be a Christmas present too, but I wasn't in any mood to finish it 4 months ago, so it sat! It is only single batted with my usual 80/20 batting. I expect it to be a lap quilt, so no wool. 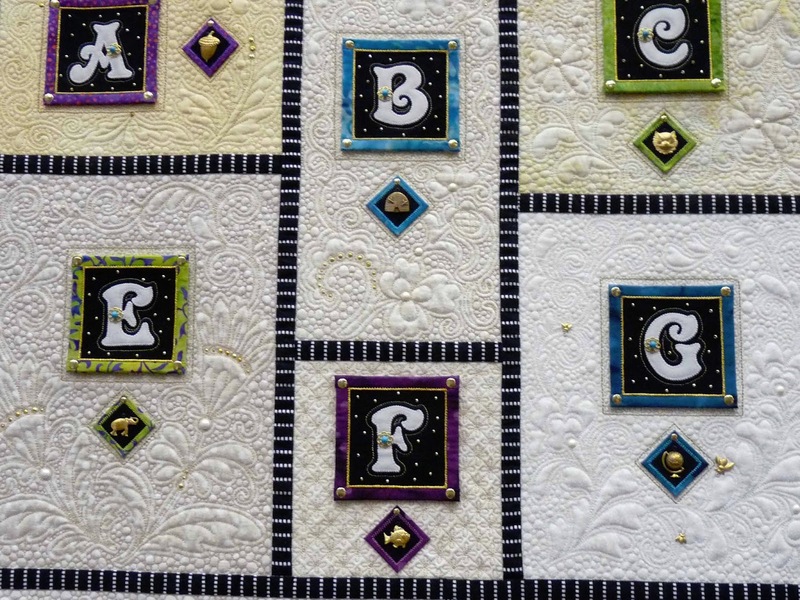 The quilting definition is just fine because it's shiny. It was fun to stitch...I think I spent 4 hours just free-stitching -- some ruler work, but mostly freehand. One thing I learned is that satin is very hard to keep a quilt square. I ended up trimming quite a bit to square it up before binding it. And binding with satin is more like binding Satan. Holy moly...that stuff is very slippery. Knowing my motivation to do any quilting the week after MQX, I knew the only way it would get bound is if it was done on machine. I never thought I'd starch satin, but it had to be done to get that stuff pressed! In the end, the binding is not my best by far, but it's not too bad. I noticed that the blue pen used to mark the quilt hadn't disappeared so I washed the quilt. Who knew satin would wash and dry so easily??! It's an interesting twist from the usual cotton that quilts are made from. It is very drapable and shows off the quilting really nice. Though it wasn't really hard to quilt, it leaves me not really thrilled that my next quilt up is made from silk!